It's my blog and I will do what I want to, do what I want to, you would blog too if it happened to you... do do do do DO. So I started posting a random picture from my phone that I took that day... which I will probably continue because I find it interesting. Tons of small goals in my head and some bigger resolutions. Put together this together and posted it on the fridge and in my work notebook. Sunday - Doug asked to be in charge and is doing a Pork Loin. For the Football game I am making this for the first time: Holiday Bacon Crackers along with a Sausage Cheese Dip my husband adores. Love it! Great resolutions! Looking forward to the recipes! I have a meal plan for the month of January (this 3 kid/working thing forces me to plan more than a week in advance), mostly from the Six O'Clock Scramble book, with at least one crockpot recipe for week (from the 365 crockpot blog). So wish me luck, and good luck to you!! 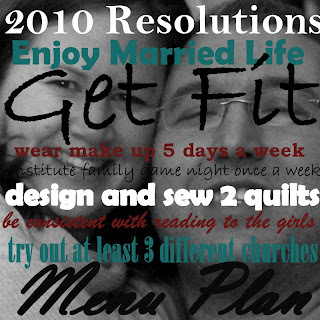 Love the resolutions picture!